Delightfully illustrated, these stories deal with concerns youngsters encounter in their daily lives. Each book points out the Good News of God's love and forgiveness, while the supporting Scripture verse emphasizes the point of each story. - Publisher Children learn the basics of faith life with this returning series. Author Dan Carr writes from a child's perspective to address common concerns. Child-friendly text and entertaining illustrations help children think about a behavior they encounter in daily life and then pray about it. Each book expresses that all sinful behaviors are forgiven through Jesus sacrifice on the cross and encourages children to go to God in prayer any time they feel tempted or troubled. Scripture examples help children apply it to their lives. This series originally appeared in 1984 and returns by popular request. 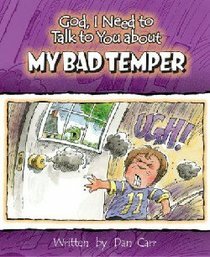 About "My Bad Temper (God, I Need To Talk To You About Series)"
Children learn the basics of faith life with this returning series. Author Dan Carr writes from a child's perspective to address common concerns. Child-friendly text and entertaining illustrations help children think about a behavior they encounter in daily life and then pray about it. Each book expresses that all sinful behaviors are forgiven through Jesus sacrifice on the cross and encourages children to go to God in prayer any time they feel tempted or troubled. Scripture examples help children apply it to their lives. This series originally appeared in 1984 and returns by popular request. Dan Carr wrote these books while he was working at Concordia Publishing House.